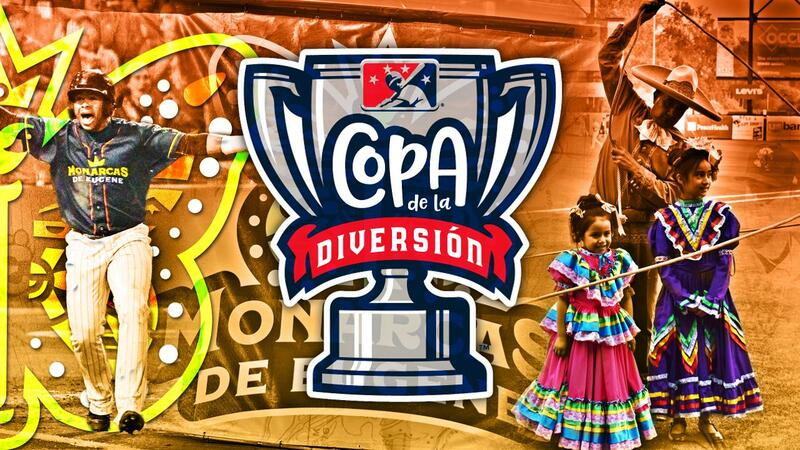 Minor League Baseball™ (MiLB™) today unveiled the finalists of its inaugural Copa de la Diversión™ (Fun Cup™) event series that took place during the 2018 season. The winner will be announced on Monday, Dec. 10, at the Baseball Winter Meetings in Las Vegas during the Opening Session. The cornerstone of MiLB's Es Divertido Ser Un Fan® (It's Fun to be A Fan®) Hispanic/Latinx fan engagement initiative, Copa de la Diversión ("Copa") established an innovative new platform authentically connecting MiLB teams with their diverse communities, embracing the culture and values that resonate most with Hispanics/Latinx nationwide. Thirty-three teams adopted culturally-relevant on-field personas and integrated more local flavor into their gameday experiences for designated games. "We are incredibly honored to earn a spot on this list of finalists for the Copa de la Diversión event series," said Allan Benavides, General Manager of the Ems. "We also want to thank our Eugene/Springfield community members for their efforts into making Los Monarcas de Eugene a tremendous success, now and moving forward." The contending teams were selected by Minor League Baseball's newly-formed Latinx Advisory Committee comprised of leaders in multicultural academia, media and marketing. The committee ranked the teams on how well they achieved the primary objectives of the Copa event series including increasing awareness, authentic engagements and attendance with U.S. Hispanics/Latinx in their local community; embracing this community and culture that is passionate about baseball, family and fun by updating their ballpark experience to match the values this specific fan segment cherishes most; creating and embracing culturally-relevant on-field personas that authentically connect them with their local U.S. Hispanic/Latinx community; and amplifying MiLB's continuous effort to diversify the game and business of baseball nationwide. "I am so proud of the work put into this initiative by our front office staff and the city as a whole," said Patrick Zajac, Director of Corporate Events and Promotions. "Our club prides itself on being a prominent and leading member of the local community, and this recognition exemplifies those efforts." The winning team will be announce on Monday, December 10th, at the Baseball Winter Meetings in Las Vegas during the Opening Session at the Mandalay Bay Resort and Casino. The announcement will follow the Awards Banquet on Sunday, December 9th, where the Emeralds will receive the Larry MacPhail Award, given to the team with the top promotional efforts in all of Minor League Baseball.